John Hampshire lives and maintains a studio in a former church in Troy, NY. 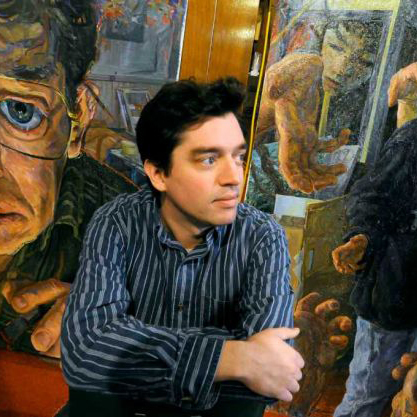 John received a BS in Art from Skidmore College in 1994 and MFA in Painting from SUNY Albany in 1997. He currently serves as Associate Professor of Art at SUNY Adirondack in Queensbury, NY. Solo exhibitions of his work include “Layers and Labyrinths” at The Show Walls, 1133 Avenue of the Americas, NYC (2008), “Expressive Eccentricities”, State College of Florida (2009), and “Labyrinthine” in The Project Room at the Phoenix Gallery, NYC (2005). Group exhibitions include “Black and White,” Lana Santorelli Gallery, NYC (2010), “International Small Works Exhibition,” 80 Washington Square East Galleries. New York University, NYC (2001-2009), and “As Others See us: The Contemporary Portrait” at the Brattleboro Museum (2008). Recent awards include a 2011 NYFA Fellowship in Printmaking/Drawing/Book Arts, the SUNY Chancellor’s Award for Excellence in Scholarship and Creativity, and the Dr. Arthur C. Collins ’48 Purchase Award, University at Albany Alumni Association.